Tanespimycin (17-AAG) is a potent HSP90 inhibitor with IC50 of 5 nM in a cell-free assay, having a 100-fold higher binding affinity for HSP90 derived from tumour cells than HSP90 from normal cells. Phase 2. (A) Cell lines were seeded in 96-well plates and treated with 10 nM of 17-AAG for 72 h. Cell survival was analyzed using CellTiter-Glo. Both parental H3122 cells (red bar) and H3122 CR cells (blue bar) show sensitivity to 17-AAG. (B) Suppression of ALK signaling by 17-AAG in resistant H3122 CR cells. H3122 parental and resistant cells were exposed to increasing concentrations of 17-AAG for 6 h.
Luminespib (AUY-922, NVP-AUY922) is a highly potent HSP90 inhibitor for HSP90α/β with IC50 of 13 nM /21 nM in cell-free assays, weaker potency against the HSP90 family members GRP94 and TRAP-1, exhibits the tightest binding of any small-molecule HSP90 ligand. Phase 2. U2OS_exo cells were incubated with AUY922 for 20 h at the indicated concentrations before stimulation with TNFα (30 ng/mL) for 30 min and immunostaining to detect NF-κB (p65). DMSO 1%, cells stimulated by TNFα in the absence of AUY922. Representative pictures used to quantify nuclear and cytoplasmic localization of NF-κB. Alvespimycin (17-DMAG) HCl is a potent HSP90 inhibitor with IC50 of 62 nM in a cell-free assay. Phase 2. H2228/Vec or H2228/HGF cells were treated with or without alectinib (0.3 μmol/L) for 2 h or 17-DMAG (0.3 μmol/L) for 24 h and then stimulated with or without HGF (50 ng/mL) for 10 minutes. The resultant cells were lysed, and the indicated proteins were detected by immunoblotting. 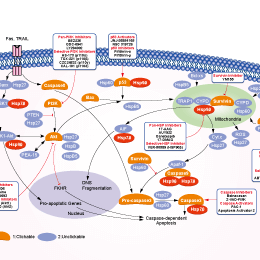 Ganetespib (STA-9090) is an HSP90 inhibitor with IC50 of 4 nM in OSA 8 cells, induces apoptosis of OSA cells while normal osteoblasts are not affected; active metabolite of STA-1474. Phase 3. Onalespib (AT13387) is a selective potent Hsp90 inhibitor with IC50 of 18 nM in A375 cells, displays a long duration of anti-tumor activity. Phase 2. Relative effect of pharmacological HSP90 inhibition by (B) onalespib (AT13387, 10-40 nM) on the viability of FANCA wild-type and FANCA null cells under normal conditions or with increasing concentrations of MMC. Left panels indicate the effects of the indicated inhibitor on cell growth; middle panels the effects onMMCtolerance in FANCA-wild-type cells; right panels the effects onMMCtolerance in FANCA null cells Data presented as the mean ± SEM from 2 independent experiments. NVP-BEP800 is a novel, fully synthetic HSP90β inhibitor with IC50 of 58 nM, exhibits>70-fold selectivity against Hsp90 family members Grp94 and Trap-1. Growth curves of the MPNST cell line S462 treated with two different HSP90 inhibitors (500nM IPI-504 and 500nM BEP800). SNX-2112 (PF-04928473) selectively binds to the ATP pocket of HSP90α and HSP90β with Ka of 30 nM and 30 nM, uniformly more potent than 17-AAG. PF-04929113 (SNX-5422) is a potent and selective HSP90 inhibitor with Kd of 41 nM and induces Her-2 degradation with IC50 of 37 nM. Phase 1/2. Effect of SNX-2112 on E. histolytica morphology. Trophozoites were treated with 3 uM SNX-2112 for 48 h. (A) E. histolytica trophozoites treated with 0.5% DMSO. Arrow indicates live trophozoite. Magnification, x 10. (B) E. histolytica trophozoites treated with 3 uM SNX-2112. Treatment caused complete lysis of trophozoites (arrow). Magnification, x 10. Trophozoites were imaged under phase-contrast microscope. XL888 is an ATP-competitive inhibitor of HSP90 with IC50 of 24 nM. Phase 1. B, XL888 (1 mmol/L, 144 hours) is effective at blocking the growth and survival of vemurafenib-resistant melanoma cell lines grown as 3D collagen-implanted spheroids. Staining shows cell viability, in which green corresponds to live cells and red: dead cells. Magnification×4. NMS-E973 is a potent and selective Hsp90 inhibitor with DC50 of <10 nM for Hsp90 binding, no activiy against a panel of 52 diverse protein kinases. (D) Representative images of paraffin-embedded tumor sections were analyzed by active caspase-3 staining. (E) Representative images of paraffin-embedded tumor sections analyzed by TUNEL staining. Effects of low-level HSP90 inhibition (by ganetespib, 2-5 nM; PU-H71, 40-70 nM) or febrile-range temperature (39 ℃) on HSP70 and HSP90 protein levels in FANCA wild-type cells. High-level HSP90 inhibition (ganetespib, 25 nM; PU-H71, 300 nM) as well as proteotoxic proteasomal inhibition (MG132, 2.5 mM) induced the expression of HSP70. Constitutive (upper band: C) and inducible forms (lower band: I) of HSP70 are indicated. HSP90 levels are shown for comparison. Apoptozole is an inhibitor of heat shock protein 70(HSP70) and Hsc70. It induces caspase-dependent apoptosis. Representative images of platelets preincubated with FITC-conjugated CD41 before treated with negative control, pitstop 2, dynasore, A23, or apoptozole spreading on immobilized Fg for 10, 30, and 60 minutes, respectively. Images were taken under oil immersion with magnification × 100. Scale bar, 5 μm. KRIBB11 abolishes the heat shock-induced luciferase activity with an IC50 of 1.2 μM. It is an inhibitor of the transcription factor Heat Shock Factor 1 (HSF1). KNK437 is a pan-HSP inhibitor, which inhibits the synthesis of inducible HSPs, including HSP105, HSP72, and HSP40. Western blots of lysates from BaF3 JAK2 V617F cells. VER-49009 is a potent HSP90 inhibitor with IC50 of 47 nM for HSP90β. VER-50589 is a potent HSP90 inhibitor with IC50 of 21 nM for HSP90β. Elesclomol (STA-4783) is a novel potent oxidative stress inducer that elicits pro-apoptosis events among tumor cells. Phase 3. Treatment with elesclomol inhibits cancer cell growth and induces apoptosis by increasing ROS levels. a. Cell growth of SMOV2, IGROV1, and OVCA432 ovarian cancer cells treated with elesclomol in the presence or absence of the antioxidant NAC for 72 h. Cell growth was measured using the WST-1 assay and quantified relative to DMSO treated controls. TRC051384 is an inducer of heat shock protein 70 (HSP70) and potent anti-inflammatory agent. HA15 is a molecule that targets specifically BiP/GRP78/HSPA5. HA15 displays anti-cancerous activity on all melanoma cells tested, including cells isolated from patients and cells that developed resistance to BRAF inhibitors. SP cells in inhibitor-treated, shRNA-transduced HCC1937 cells analyzed by flow cytometry using Hoechst 33342 dye. Data are shown as mean±SD. ****P<.0001, ***P<.001, **P<.01, *P<.05.